Gunmen opened fire on a beach popular with tourists in Tunisia on Friday, killing at least 37 people, the country’s interior ministry said. 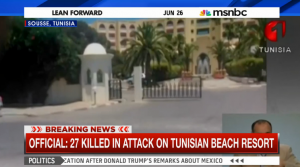 Tunisia’s Interior Ministry told NBC News that most of the victims were foreigners and that at least six people had been injured in the attack in front of the 5-star Imperial Marhaba hotel in Sousse. One gunman had been killed and a second captured following a security-forces operation in the popular seaside resort, the ministry added. The ministry said there were “several” nationalities among the dead — including British and Tunisian citizens. Dhishallah Fredg told NBC News that he saw a gunman take out a machine gun that had been hidden behind a sun umbrella and open fire on the beach-goers. Fregh — who manages the El Mouradi Palmarina Hotel, which is next door to the Imperial Marhaba — estimated he was around 100 feet from the gunman. The deadly assault came just hours after an apparent terror attack on a factory in France. French President Francois Hollande telephoned Tunisian President Beji Caid Essebsi to express solidarity in light of the Sousse attack, according to Hollande’s office.